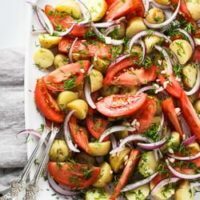 This new potato salad is incredibly flavourful and super budget-friendly, especially when tomatoes are in season. This salad can be served as a side dish for a weeknight dinner and is perfect for a BBQ party. 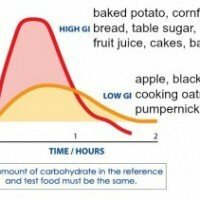 If you have been following low Glycemic Index / low Glycemic Load way of eating for a while, you probably already know that potato is a very high GI and high GL carbohydrate: Glycemic Index of a baked potato is 85 and Glycemic Load is 26; the mashed potato is even worse with the Glycemic Index of 92 and the Glycemic Load of 18. But don’t worry. You can still enjoy North America’s favorite vegetable. 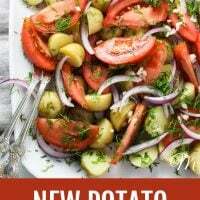 New potato has a medium Glycemic Index of 62 and the Glycemic Load of 13. This recipe is very versatile because you can easily adapt it to your taste preferences. For example, you can use parsley or basil instead of dill, add more garlic if you like it or skip it all together. If you want to add more crunch to the salad, it will only benefit from some fresh cucumbers. 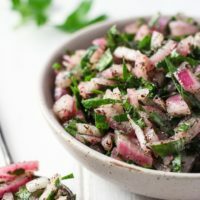 If you like marinated onions, try adding these Sumac Onions instead of the regular red onion. 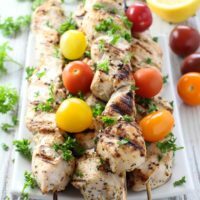 This new potato salad makes a perfect side dish for these Yogurt Marinated Chicken Kebabs. 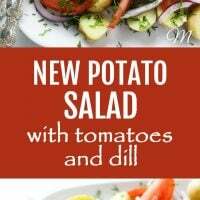 This new potato salad with tomatoes makes a perfect side dish for a weeknight dinner or a BBQ party. It’s budget friendly and very easy to make. 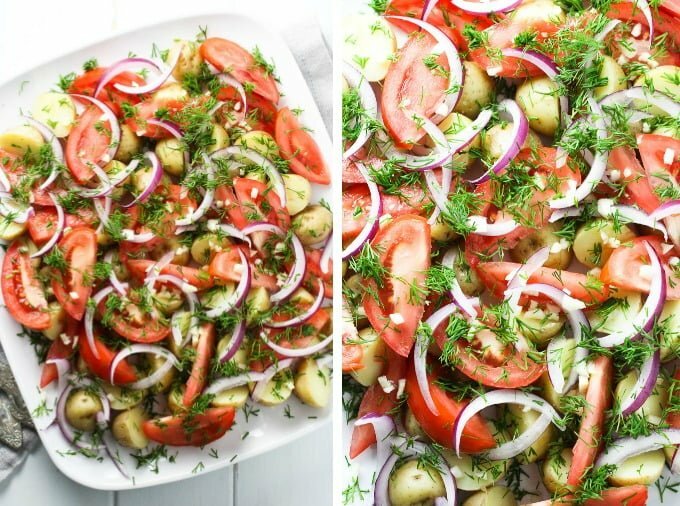 Dill, onion, garlic, white wine vinegar, and olive oil lend this salad lots of flavor. This salad is naturally gluten-free and vegan. Wash the potatoes and put them in a medium saucepan. Add cold water to cover the potatoes by about an inch. Boil the potatoes for about 5 to 8 minutes or until you can pierce them with a fork. Do not overcook! Remove from water and let them cool completely. You can leave them in the fridge overnight. 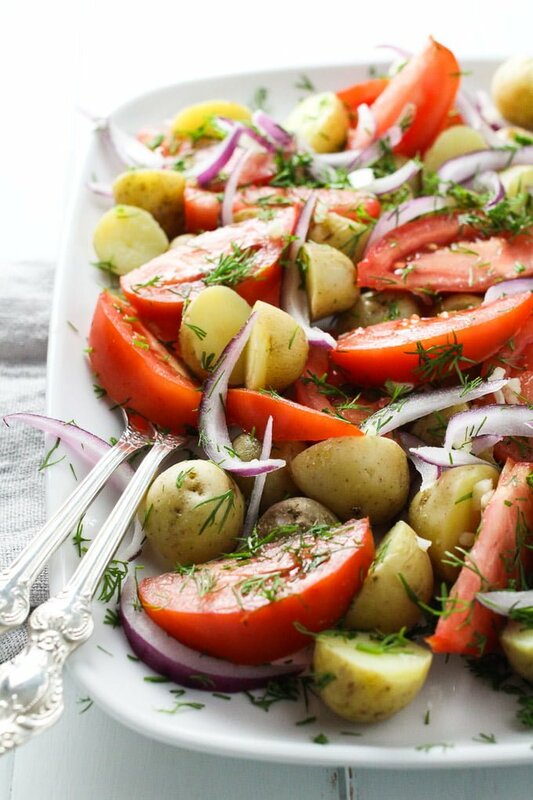 When ready to make the salad, cut the potatoes in half and place them in a large salad bowl. Add the tomatoes, onion, dill, garlic, white wine vinegar, and olive oil. Generously season with salt and toss to combine. Alternatively, you can also arrange the salad on a platter. 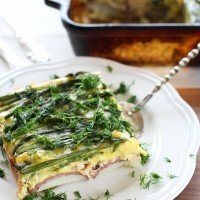 You can serve the salad right away or let it cool in the fridge for about 30 minutes. 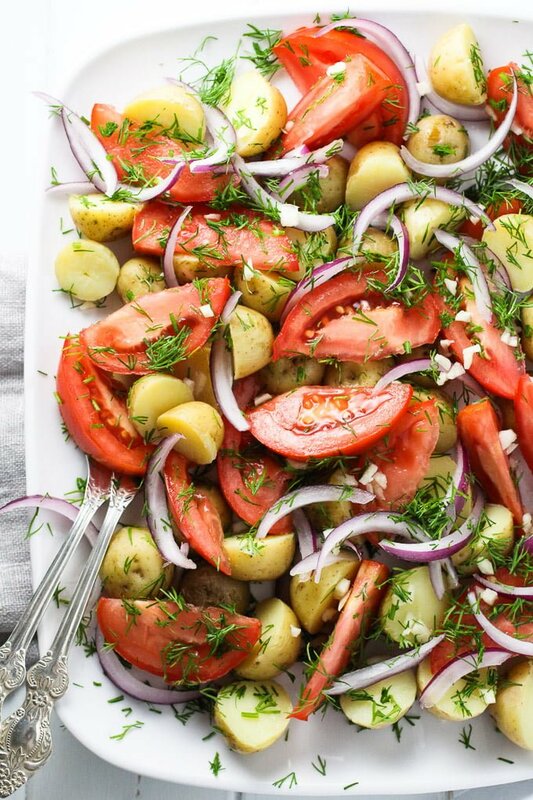 Nutrition information is a rough estimate for 1 of 4 servings calculated for 1 pound of new potatoes, 2 tomatoes, and 1.5 tablespoons of olive oil. This was a great blend of flavours. 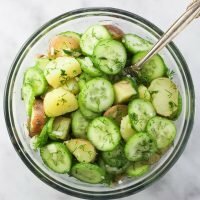 It is very similar to your potato cucumber salad with garlic and dill so I combined the two recipes. It’s a great idea! 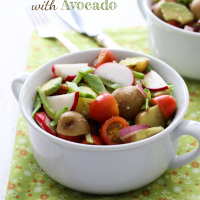 Radishes would also be good in this salad. I tried it again following your suggestion to add radishes and it was even more delicious!